Major League Eating is a competitive competition in which participants compete against each other to eat large amounts of food in the shortest time period. Speed eating typically lasts up to 10 minutes, with the person consuming the most food being declared the winner. The sport of competitive eating is a huge hit in the U.S, and contestants compete in professional eating contests for cash prizes. In this documentary Vice travelled to Nevada to meet some of America’s up-and-coming stars of America’s Major League Eating scene. 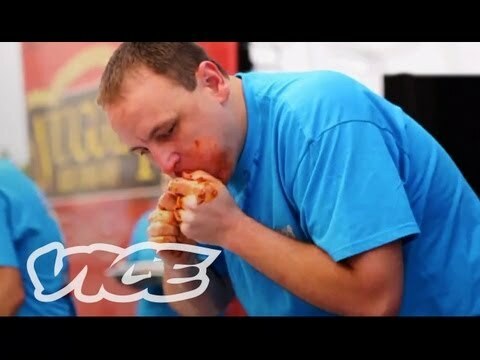 Miki Sudo and Juan “More Bite” Rodriguez take us inside the life of a competitive eater, polishing off enormous plates of food like they were finger sandwiches while vice filmmakers nearly passed out from having all the blood in their bodies rush to the aid of their stomachs. During the film, we get to watch Miki and Juan compete in the annual Best in the West Nugget Rib Eating World Champion, against none other than Joey Chestnut, the LeBron James of cramming food down your throat. Michael Jordan to the Max is about the life and career of basketball player Michael Jordan, focusing mainly on him during the 1998 NBA Playoffs.